These .308 Winchester soft point rounds are an excellent low-cost hunting cartridge suitable for battle and bolt-action rifles. 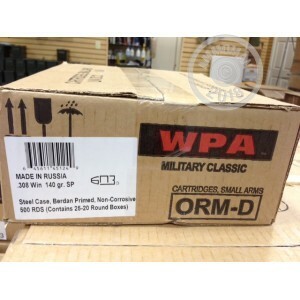 Imported by Wolf, they use a light 140 grain projectile, non-corrosive Berdan primers, and non-reloadable steel cases. Each case contains 500 rounds in 25 boxes of 20 rounds each. 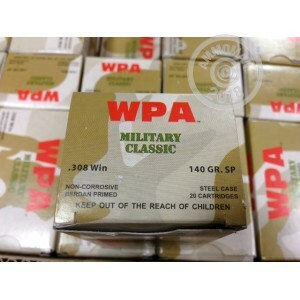 Steel-cased ammo uses a polymer coating for reliable feeding and ejection. While not reloadable, it costs less to produce than brass cased ammo and offers an excellent value for field use. 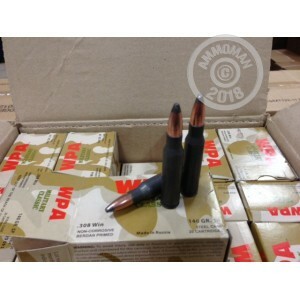 Buy this case of Wolf ammo or any other products totaling $99 or more to take advantage of AmmoMan.com's free shipping guarantee for large orders.